Dean Guitars were initially founded in 1976 by a man by the name of Dean Zelinsky who resided in the windy city of Chicago, Illinois. Zelinsky was a luthier but eventually became well known for being an innovator in the design of electric guitars (interestingly, he was the man who designed the spinning fur guitars for ZZ Top's "legs" video) and innovations like custom wound pickups. But after ten years of production, Dean made the monumental decision that he no longer wished to manufacture guitars and sold his legacy to a man by the name of Oscar Medeiros who held rights to the trademark until the mid 1990's. Madeiros, after contributing his own brand of genius to the production of guitars for a period of time then passed the company on to another man by the name of Elliot Rubinson who breathed life back into the faltering company and continues to own and operate the Tampa-based company to this day under the name "Armadillo Enterprises." Despite the fact that the company has changed hands numerous times, quality Dean guitars are still played and cherished by many well known artists ranging from Megadeath's Dave Mustaine to former great Pantera shredder Dime Bag Darrell. The Dean Resonator Heirloom Brass is an unusually beautiful piece of musical craftsmanship and features a solid distressed brass-plated steel body, mahogany neck and rosewood fingerboard. "F" holes grace the brass top which aid in tonal projection and increase the guitar's overall visual appeal. The resonator itself is referred to as a single cone, which simply implies that the device contains only one layer of aluminum that acts as the resonating mechanism. The entire guitar, aside from the neck and fretboard, is composed of metal and subsequently the guitar is extremely heavy especially when compared to the wooden bodies that most of us have become accustomed to. Nevertheless, the shimmering brass facade grabs you from the moment you set your eyes upon this beauty and leaves you with a very lasting and distinctive image. The Dean Resonator Heirloom Brass measures 24 and 3/4" and is approximately 3" deep. The neck itself is shorter than most guitars and has only 16 frets, 12 of which are accessible (the 12th is barely reachable). The guitar also features beautiful brass dot inlays on the neck which help to tie it together to the overall color scheme of the guitar. 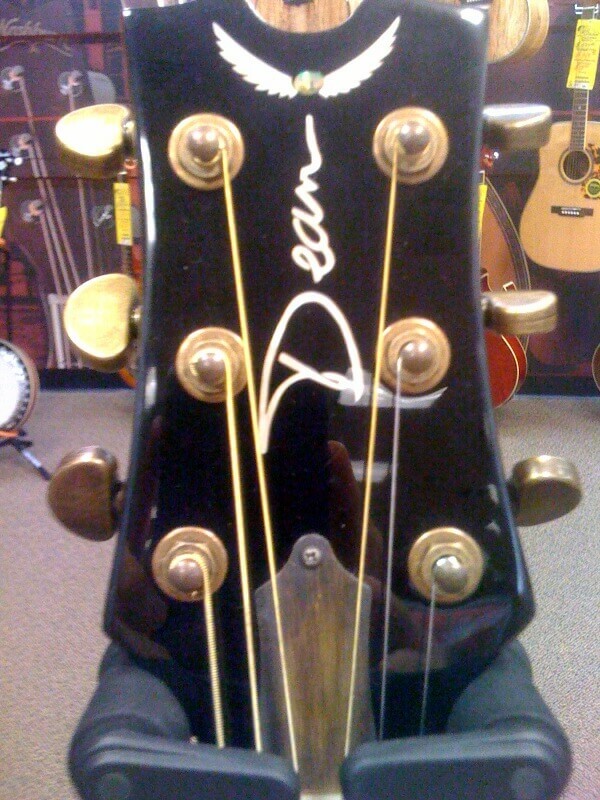 The headstock features the traditional wing pattern that Dean has become renown for and the tuners are die cast and made by Ping. The Dean Resonator Heirloom Brass is currently available through local music stores and is going for anywhere between $640 and $960 depending on where you shop, and how well you haggle. Dean debuted their Heirloom series several years ago in Nashville Tennessee and these guitars received a warm reception by players of all ages and skill levels. The Heirloom brass is an incredibly beautiful piece of craftsmanship but since the body features a brass finish which tends to be quite expensive, it is possible that the external appearance of the guitar is the bulk of what you're paying for. The Dean Heirloom Brass has a nice sound to it but seems to lack projective quality. This is quite possible due to the fact that the resonator utilizes only one cone as opposed to more expensive resonators which tend to use three. When I used a slide it did tend to bring out a little more volume but in general I was disappointed by its lack of projection. The guitar had a fairly good representation of high end values but seemed to lack much in the bass and mid range regions. Also, the sheer weight of the guitar might impede some players from being able to stand while playing and although many blues style and slide players do sit while performing, I feel it's a point worth mentioning. 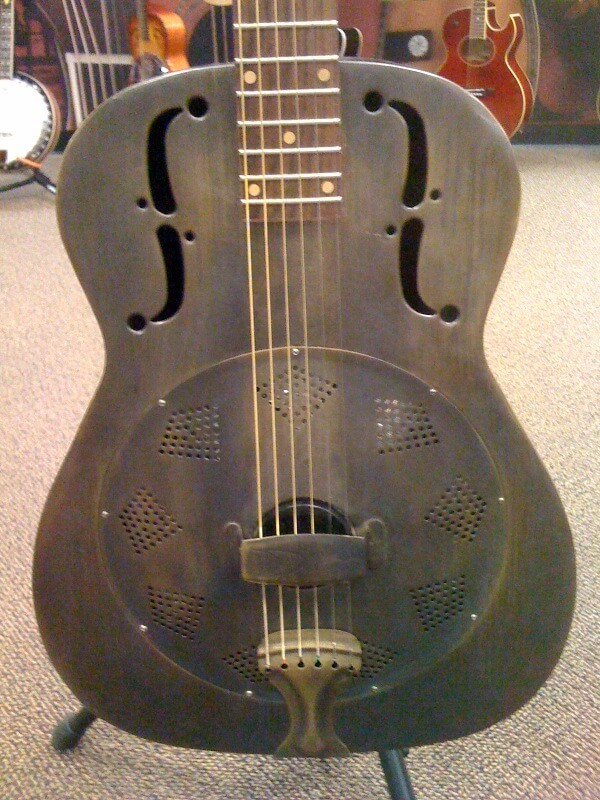 The Dean Resonator Heirloom Brass is an exquisite looking instrument but may not be suitable for some players.